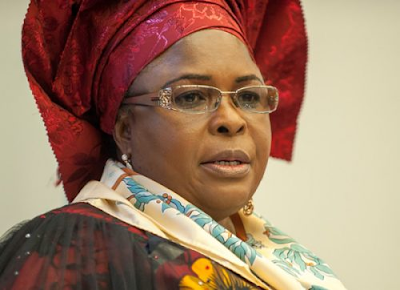 The Economic and Financial Crimes Commission EFCC has reportedly traced a multi-billion naira property said to be owned by former First Lady, Patience Jonathan. The Nation reports the antigraft agency is currently investigating the property and may place it under Interim Asset Forfeiture. The agency is said to also be investigating the relationship between Mrs. Jonathan and two companies being probed by detectives. Also, three accounts and three more properties have been put under surveillance by the anti-graft commission in connection with the ongoing investigation of the ex-First Lady. The three accounts belong to Aribawa Aruera Research Foundation; Finchley Top Homes Limited and AM-PM Network Limited. The accounts were uncovered in the course of investigating Mrs Jonathan and Aribawa Aruera Research Foundation. The anti-graft commission is suspecting a business relationship between Mrs. Jonathan and Finchley Top Homes Limited and AM-PM Network Limited. Preliminary investigation revealed that huge slush funds might have been laundered through the foundation and the two firms. A report indicated that Aruera Foundation is registered with the Corporate Affairs Commission (CAC) with RC No 22805. “Huge funds were suspected to have been laundered into the accounts of the above mentioned companies and properties worth billions of naira were allegedly acquired by ex-First Lady Patience Jonathan through the aforementioned companies. Detectives were able to track transactions through open source information from interbank settlement. The ex-First Lady and five others are trustees of Aribawa Foundation. Intelligence from Abuja Geographical Information Service (AGIS) revealed that a multi-billion naira property, Plot No. 1758B06 in Mabushi Area, belongs to the foundation. The said property is not such that a state Permanent Secretary in person of Mrs. Patience Jonathan can afford. The property should be marked as under investigation and interim forfeiture order be secured.” The ex-First Lady is being probed in connection with three other assets – Plot 96(DO5) in Karsana ; Plot 7109 (E18) in Wasa; and Plot 30 (DO3) in Idogwari. Besides, EFCC detectives have turned their searchlight on the ex-First Lady’s relationship with Finchley Top Homes Limited and AM-PM Network Limited. Another source added: “We have conducted searches at the Corporate Affairs Commission (CAC) on the two companies whose accounts were earlier frozen alongside that of the ex-First Lady over $5.8 million which was reasonably suspected to be proceeds of crime. The latest probe of Mrs. Jonathan has raised the number of properties linked to her to 17. According to the EFCC source, about 13 properties were initially associated with the ex-First Lady in Port Harcourt and Yenagoa. The assets in Port Harcourt are former Customs Service Officers Mess; two duplexes at 2/3 Bauchi Street; landed property with blocks at Ambowei Street; three luxury apartments of four-bedroom each at Ambowei Street; and Grand View Hotel on Airport Road. Other assets in Yenagoa include two marble duplexes at Otioko GRA by Isaac Boro Expressway; Glass House on Sani Abacha Expressway, which is housing the Nigerian Content Development and Monitoring Board; Akemfa Etie Plaza by AP filling Station, Melford Okilo Road; and Aridolf Resort, Wellness and Spa on Sani Abacha Expressway.